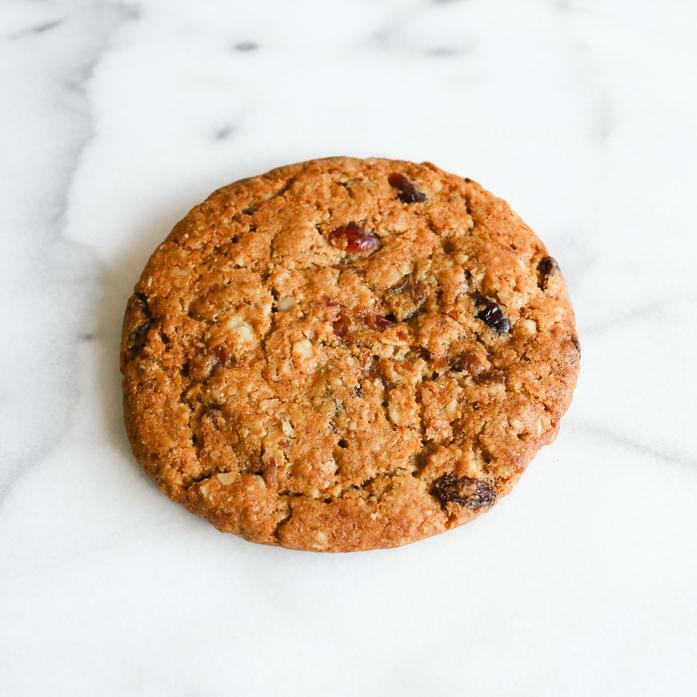 This gluten-free version of a classic oatmeal cookie sacrifices nothing by blending rolled oats and creamy regional butter with golden raisins and a twist of tart cranberry. It is moist, chewy, and delicious! Ingredients: Old fashioned rolled oats (gluten free), brown sugar, unsalted butter, walnuts, sugar, free range eggs, raisins, dried cranberries, sorghum flour, garbanzo bean flour, potato starch, golden raisins, tapioca starch, pure vanilla extraxt, xantham gum, baking soda, baking powder, salt, ground cinnamon.